Einfach ein tolles Hostel! Frühstück war super lecker und free diner war auch super! Sehr gemütliche Atmosphäre, top! A nice and quiet place to have some nice days in Banos. I recommend it! 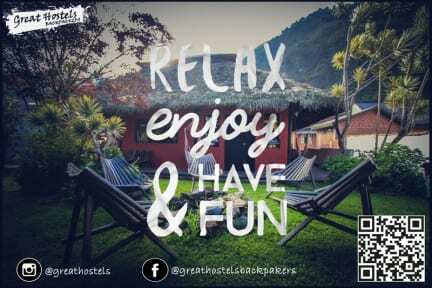 Great hostel in baños. The common room is good to meet new people. Breakfast is included and delicious. Some days dinner is for free. They organize some activities. Best place to stay in Banos. The breakfast is pretty good and included. Closed to the city and more quite than in the city center. Good to chill in the hammock. Nice atmosphere. Nice atmosphere and it's pretty easy to know the people. Got food poisoning from the food of the Hostel. Unorganized staff (had no key for my room for the first day) and the worst shower I had.